Bidvest Insurance Brokers (Pty) Ltd (“BIB”) is committed to complying with the regulatory requirements governing Conflict of Interest under the FAIS General Code of Conduct and ensuring that conflicts of interest are appropriately managed in the best interests of our partners, customers and policyholders. The Financial Services Provider (“FSP”) is Bidvest Insurance Brokers Pty Ltd (“BIB”), FSP no. 44446. This policy is applicable to all representatives of BIB. It is the responsibility of each individual who is affected by this Policy to proactively, and in good faith, declare an actual or potential conflict of interest, and to seek advice in cases of uncertainty. This policy was formally adopted by the Board of Directors of BIB on 17 February 2014. Before a new business arrangement is concluded, consideration is given to whether the proposed arrangement will present any potential conflict of interest. It will be the responsibility of the Managing Director, Operations Director and/or Financial Director entering into the relationship on behalf of BIB to ensure that this identification process is carried out and appropriately documented before the relationship is progressed and concluded. All representatives are responsible for identifying specific instances of conflict of interest and are required to notify their Business Unit Manager, General Manager and/or Financial Director of any conflicts they become aware of. Once a conflict of interest has been identified it needs to be appropriately and adequately managed. The Business Unit Manager and General Manager responsible for the affected area will consider whether any practical means exist for avoiding such conflict of interest. 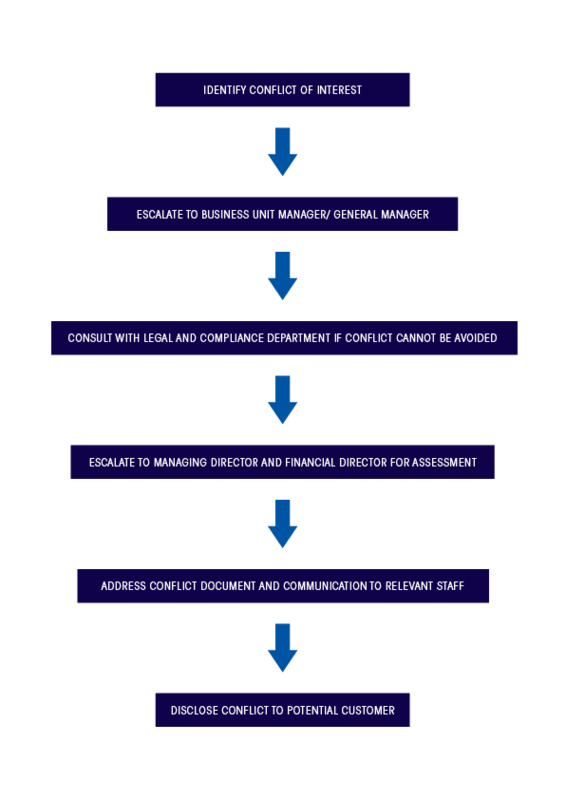 Where this is not practical, the Business Unit Manager and General Manager will consult with the Managing Director and Financial Director to devise appropriate and adequate measures to mitigate and manage the identified conflict of interest. The resulting mitigating and managing measures will be documented and communicated to all staff involved in managing the relationship to ensure that the risk of the identified conflict of interest is appropriately managed and does not recur. Employees must maintain the confidentiality of information received from insurers, customers, suppliers and intermediaries. All gifts made and gifts received in excess of R200.00 must be recorded in a Gift Register maintained by BIB. The customer’s free choice whether he/she wishes to continue with procuring the product. The onus is on the representative employees subject to this policy to ensure that proper disclosure is made in respect of a conflict of interest despite this being contained in the product fulfilment documentation. The Executive Management of BIB must ensure that the policy is implemented. Training for all affected staff will be provided by the BIB Management and Legal and Compliance Department to ensure that they understand their responsibilities under this policy. The BIB Management and Legal and Compliance Department will monitor compliance with this policy and will perform the necessary reviews in consultation with Executive Management of BIB to ensure that effective and appropriate procedures and processes are in place in order to comply with the policy. The BIB Management in conjunction with the Legal and Compliance Department will facilitate a review of this policy annually to ensure that it remains relevant and appropriate to meet the statutory requirements. The FAIS External Compliance Officer will include monitoring of the Conflict of Interest Management Policy as part of the general monitoring duties, and will report thereon in the Annual Compliance Report to the Financial Services Board (FSB) or upon any ad hoc requests by the FSB. (b) The quality of the services rendered to customers (as measured by the BIB Quality Assurance process). (f) Any other financial interest, for which consideration that is reasonably commensurate with the value of the financial interest, is paid by that FSP or representative at the time of receipt thereof. List of associates of the Financial Services Provider A list of associates is available on request at the registered office of BIB. BIB does not hold any ownership interest in third parties. Third parties who hold an ownership interest in the Financial Services Provider There are no third parties who hold an ownership interest in BIB. BIB is a wholly-owned subsidiary of Bidvest Financial Services (Pty) Ltd, a non-operating holding company which is, in turn, wholly owned by The Bidvest Group Limited. Consequences of non-compliance with the policy The Conflict of Interest Policy is provided to all representative employees and staff. All representative employees and staff are required to read this policy and sign a statement confirming that they have read and fully understood the provisions of the policy and the application thereof. Failure to comply with the provisions of this policy by any representative employee or staff shall constitute serious misconduct and will result in disciplinary action being initiated against them. Avoidance, limitation or circumvention of this policy will be deemed serious non-compliance. This policy was adopted by the Board of Directors of Bidvest Insurance Brokers (Pty) Ltd on 17 February 2014. The following definitions are extracted from the FAIS Act 37 of 2002 and Board Notice 58 of 2010. Associate means – In relation to a juristic person, which is a company, any subsidiary or holding company of that company, any other subsidiary of that holding company and any other company of which that holding company is a subsidiary. (b) training, that is not exclusively available to a selected group of financial services providers or representatives, on (i) products and legal matters relating to those products; (ii) general financial and industry information; (iii) specialised technological systems of a third party necessary for the rendering of a financial service; but excluding travel and accommodation associated with that training. (c) a financial services provider, who for its benefit or that of some or all of its representatives, aggregates the immaterial financial interest paid to its representatives. (b) includes any dividend, profit share or similar benefit derived from that equity or ownership interest. Responsible person means a key individual, representative or employee of a product supplier or financial services provider. (b) does not lead a client to any specific transaction in respect of a financial product in response to general enquiries. (e) any person who in terms of an agreement or arrangement with a person referred to in paragraphs (a) and (d) above provides a financial interest to a financial services provider or its representatives.